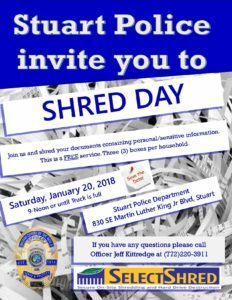 Shred your confidential documents at Stuart Police Department. Date and Time: Saturday January 20, 2018 from 9:00AM to Noon or until the truck is full. Shred up to 3 standard size boxes (each weighing 30 Lbs.) per household. Right click on Image and open in New Tab for additional information.